Over at her blog, Random Thoughts From Midlife, Christine Grote has posed the question why do you write a blog? I’ve been a thwarted writer for years. Blogging is an outlet for my creative expression. I’d love to make a living writing – any kind of writing. Early in my career, I tried to switch from taxes to communications, but I didn’t have the education or experience for it. As much as writing appeals to me, I can’t just quit to do it. My favorite boy toy is a fine art photographer and one of us has to have a reliable paycheck! I could write part-time on the side, but I didn’t want to spend hours sequestered from my family to write, go through the hoops of being published, and for what? No money, no glory, begging a publisher to print my book? My family relationships were a higher priority. My job took enough of my time and attention away from them. I have published from my journals before. When The Diarist’s Journal was still published quarterly (early 1990’s), I was printed nearly every quarter. I wrote in Live Journal, an on-line predecessor to WordPress and Blogspot. I was unable to generate any traffic and to be honest, a lot of the other bloggers seemed to be immature teenagers whose favorite word started with an “f”. There were some good blogs out there, but not enough of them. So I kept writing, but kept it to myself. My journals have pages and pages of discoveries and observations, recording of my various adventures, and memories of my life. But it was frustrating to not share it with anybody. I’ve loved reading blogs for quite a while. I read them for all kinds of reasons, from educational about topics such as cooking, homesteading, and blogging to supporting authors that I like such as Jon Katz and Kathy Harrison. Some blogs are just fun to read. And now, I have blogs I follow because I’ve made new friends in blogosphere, including KittyHere who has been doing this daily challenge since the beginning of the year. My goal earlier this year was to write, write, write. I’d thought of trying a blog again – there are so many good ones out there! – and I wanted my thoughts to see the light of day. So I hang in there every day, even when I don’t feel like doing the word of the day, even when I don’t know HOW I’m going to use the word of the day, even when I don’t want to spend more time at the computer after being at work all day. Because it’s worth it to share my thoughts, get the feedback, hearing from my friends (old and new), and bringing joy to those around me. Each time I think of skipping a night, I think a) Kitty will be posting and I have to keep up; b) my Mom will miss it; c) my girlfriend’s daughter, Jaimie, will be looking for more dog pictures; d) it greatly amuses everyone to see how I use today’s word and e) if I want to write, I need to write. And so I write. Thank you to everyone who reads my blog and especially to those who leave comments or click the like button. You’re the greatest! Of course, not everyone feels thwarted. 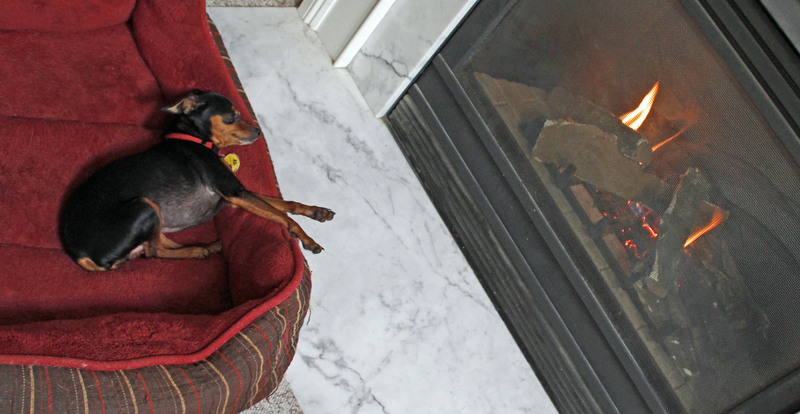 Some are downright pampered and spend their naptime in front of the fire, roasting their little body. Word for tomorrow – BEGUN. If you prefer to work ahead, see the list for the week under “A Word A Day”. Every time I think a word is impossible or that too much is going on I think that Nancy decided to jump in and post a list of words each week when Jen of ‘Cabin Fever in Vermont’ stopped here 365 photo a day blog. And that has been OK. Some days I do take new shots but other days I get to reminisce about past travels. I don’t have the ambitions Jen had/has with her photography. I’m going to stay a point & shoot camera girl who just does some basic editing with free software. Nor to have the writing ambitions or experience of you, Nancy. But I do like having a task to complete, something that makes me have to think in different ways. And I have enjoyed discovering the fun of having people, even if the numbers are few, take a look at what I’ve done. So Nancy a long post means I can leave a long comment, right? In the arts being a painter, a composer, an actor, a writer, etc. does not always mean you get paid for it. It is the doing it daily that makes you whatever type of artist you choose to be. So Nancy I say that your statement “I need to write. And so I write.” makes you a writer no matter what you can paid for 9-5! Kitty – Thank you so much! What a wonderful comment. Jen was ambitious, but it was too much with her job, school and then a baby on the way. Earlier this summer I got a bit discouraged because I felt I wasn’t writing about topics that I wanted, it was too much to do 7 days a week, blah blah. That’s when I started keeping a list of what I wanted to write about and plugging in the topics when the word came up. And some days, I keep it short with a photo. I’ve enjoyed doing it much more than I expected. I’ve enjoyed seeing all the pictures from your travels. I’m always surprised by how differently you can use the word. Of course, today you had my very favorite – chocolate. Yum yum. You’ve been a wonderful companion in this challenge. It’s certainly been fun. Pets always get the best seat in the house. :) Congratulations on consistency with your posting. That speaks volumes that it is a priority to you. The more you write, the better you get. These are the nuggets I bring home from my writers group. And did you notice how big that dog bed is? If I get him a small one, he’d still take over the big one and I’d have a Vizsla squeezing into the tiny one. The min pin is so greedy. Thanks for the compliment. My writing has definitely improved which has improved my blog content tremendously. He is quite a velcro dog. He’s also a couch potato. I don’t know how these dogs make such good hunters. I have yet to hear of a comfy couch being out in the fields. Jaimie recognized her name as I was reading and she was waiting for me to get to the photo. She was surprised and happy to see it there. She loved the photo of your pampered friend and thought he needed to be grabbed and hugged a bit. :) He is very lucky we don’t live close by. I’ll let Samson know that if ever needs love, he can be shipped off to Jaimie. Knowing that you are both faithful readers and how much Jaimie enjoys it does keep me going. You’re not alone. I think we all wonder what’s the point from time to time and feel like quitting. I believe just the process alone of sitting down, organizing my thoughts, and typing them out is worth it all, even if no one reads. If you decide to try to write that book, you can publish it yourself. It’s not as glamorous, but you will be able to have it out there with readers. I am so glad I did. My plan it to self publish. That way I can keep it short and not have to worry about making it long enough to attract a publisher. I’m thankful you’ve been posting on this topic as it’s helped me think this through quite a lot.